Jenelle from our Customer Service/Shipping team shares her go-to vape! Vapor Production - If an atomizer doesn't blow substantial clouds, I feel like I'm missing out. The more vapor, the better. Battery Life - I'm a heavy vaper. My vape hardly ever leaves my hands, and since I don't love toting around spare batteries, I need a mod that will last all day. Flavor - Flavor is important to me: when I vape, I want to taste the e-juice, not the wicking material it's saturating. When organic cotton wicks hit the market, I could immediately taste the difference. The flavor from my e-juice was much cleaner than before. Durability - I'll admit - I can be a little clumsy. I'll carry five things at once, instead of taking two trips, so my devices have to be durable. If they can't survive a few falls or don't have replacement parts available, it's a deal-breaker for me. With all of my preferences in mind, when Eleaf released the iStick 100W, I was immediately sold. I paired it with a Kanger Subtank Mini (which I already loved using). On their own, these two are very versatile. 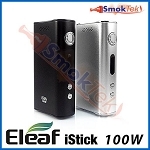 With 100W max output, I can put any of my other toppers on the iStick 100W. And, with the included rebuildable deck, I can make my own coils to use in the Subtank Mini. Paired together, these two are my ultimate vape. Vapor Production - Using a 0.5 ohm Vertical OCC coil at 30 Watts, with the airflow wide open, the Subtank Mini puts out big, dense clouds of vapor. The vapor is on the cooler side, so my drip tip never burns my lips. Even with a sub ohm coil, the Subtank Mini doesn't go through juice too quickly, which means it's fairly efficient compared to some other juice-guzzling, sub ohm tanks out there. Like I mentioned earlier, I vape a lot, and I tend to refill my tank twice a day. So, the bigger Subtank Plus (7ml capacity) would probably be more convenient for me. But, I like how the smaller Subtank Mini looks on the iStick, so I don't mind the 4.5ml e-juice capacity. Flavor - The Organic Cotton Vertical coils are simply amazing. I love fruity flavors, and all of my e-liquids taste clean and pure in the Subtank Mini. I never get a dry hit with these coils, even though I chain-vape pretty often. Durability - Being able to purchase a replacement pyrex tube (or airflow control valve, or o-rings) for the Subtank Mini is a huge plus for me. I'm notorious for dropping my device, so easily replacing broken parts, instead of buying a whole new Subtank Mini, is a must. Also, since the iStick 100W doesn't have a built-in battery, it means the mod will last me much longer compared to many devices with a built-in battery. I also like to keep a silicone cover over the mod: if I drop the iStick, it helps absorb some of the shock, and it keeps the magnetic battery cover on, preventing the batteries from potentially popping out from the impact. It also protects the mod from scratches. 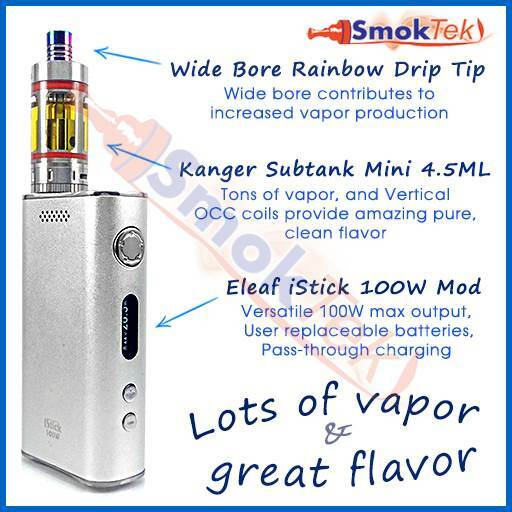 The Eleaf iStick 100W and Kanger Subtank Mini are my favorite set-up. If your personal list of requirements looks like mine, you have to check these two out! 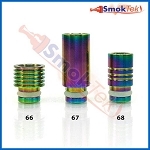 Note: I swapped out the original drip tip that comes with the Subtank Mini for a Wide Bore Rainbow 510 Stainless Steel Drip Tip in #68. I like that its shorter - and it's rainbow!